The Santuario de Guadalupe in Santa Fe, New Mexico, was built shortly after 1776. It is the oldest, still-standing shrine built in honor of Our Lady of Guadalupe in the United States. The Santuario de Guadalupe was constructed adjacent to the Santa Fe River and near the end of the El Camino Real (Royal Highway), a colonial trade route from Mexico City through Chihuahua to Santa Fe. CoIonists from Mexico in the 17th and 18th centuries brought devotion to Our Lady of Guadalupe with them to what is today the state of New Mexico in the United States. 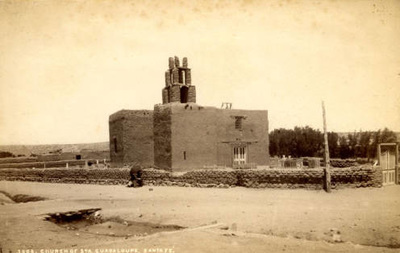 The first church of Our Lady of Guadalupe was a tiny adobe structure built as a shrine to Our Lady of the New World. 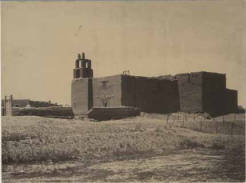 The Santuario not only served the faithful from the City of Santa Fe, but welcomed travelers who ventured into the city. The church is also home to the largest oil-on canvas Spanish baroque reredos (altar screen) painted by by Jose de Alzibar 1783 and a statue of Saint Juan Diego by renowned artist Gogy Farias from Mexico City. The small museum onsite provides a bit more history including images and stories, and the Walking Rosary and Tepayac Hill are inspiring additions. Many local items can be found in the gift shop , as well. Three times a week, volunteers provide a hot meal for the needy at lunch through the Parish Hall and important celebrations take place throughout the year. Unveiling of the Virgin de Guadalupe in Santa Fe, New Mexico ~ Sunday August 31, 20008 - View the video by Joshua Trujillo.